The concept of variety has been carried into all areas of Red Mountain. There are large and small greens; some with subtle breaks, some with wilder contours. Bermuda grass is used on the greens which make for fast but smooth putting surfaces. 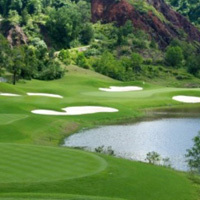 Fairways and tees are grassed with Seashore Paspalum; a popular turf being used at other Thailand championship courses like Amata Springs and Best Ocean, both in Bangkok. Wild, local grasses have been preserved in some rough areas to complete the natural look. The Loch Palm site, being located almost in the exact center of Phuket Island makes this course one of most accessible to those staying on the poplar Patong and Karon beaches. Only 15 minutes is needed to get to/from the course which makes it a real possibility for those with non-golfing families to spend the better part of the day with their family after a quick early morning round.